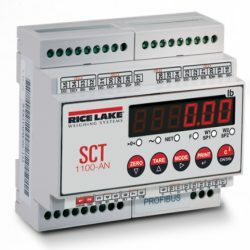 SCT-1100 multi-function transmitters from Rice Lake have a compact design while presenting the same signal-conditioning functions. Red LED display (13mm) and six LEDs to showing active functions. Standard DIN rail-mounting with power supply and enclosures. Configurable calibration and setup parameters from keyboard.